Wave energy company Aquamarine Power USA, a subsidiary of the UK's Aquamarine Power, has been awarded a $100,000 matching grant by the Oregon Wave Energy Trust (OWET) to gather data on the wave energy potential of the sea along Oregon's coast. The grant is for Acoustic Doppler Current Profiler (ADCP) installation. The ADCPs will measure the wave energy resource at a number of points along the coast. This is an essential first step in finding areas suitable for wave power projects. Aquamarine Power's goal is to find a potential location for the installation of a demonstration array of three wave energy devices which the company aims to install by 2016. The company will match the grant with $100,000 of its own funds. 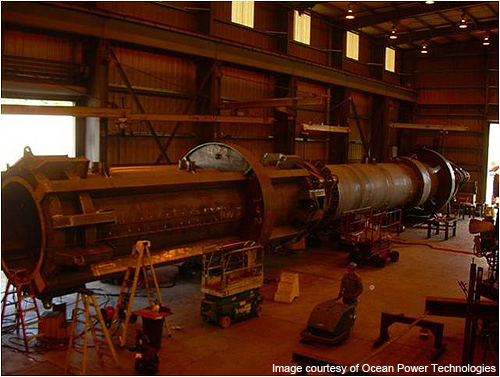 This follows the award of a $50,000 matching feasibility grant to Aquamarine Power USA by OWET in November 2010. The two grants will support a study into the wave energy potential off the coast in the service areas of Central Lincoln People's Utility District and Tillamook People's Utility District. Oregon and this resource assessment will enable us to identify sites with potential for an initial 3MW demonstration project. This would involve three devices being installed in Oregon waters by 2016." McAdam says the studies will be dependent on his company securing seabed leases for the ADCPs from the Department of State Lands and a clear route to completion of the state's Territorial Sea Plan process. "We hope the state will put in place the leasing and permitting regime which will give us the confidence to deploy the ADCPs next year and unlock our investment in Oregon. Currently this is not possible," McAdam added. "The successful completion of the Territorial Sea Plan, which aims to produce a marine spatial plan for marine energy development, is crucial to our company and to others who wish to work in Oregon. The ADCP study will enable us to gather top quality scientific data on the state's wave energy resource and enter into more informed discussions on the economic and environmental benefits which a thriving marine energy sector could bring."